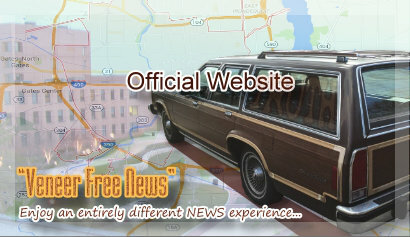 FAUX NEUZ is a new way to get news. Instead of trying to sort through countless news websites, each with their own spin, to find the ‘real’ news, FAUX NEUZ provides a list of news stories focused on your interests and views. How is this done? FAUX NEUZ is a FREE online service that uses generic information about you, as well as your browsing habits, to provide news prioritized by others with similiar interests and backgrounds. It uses existing news stories from a wide variety of sources, including CNN, Fox News, MSNBC, The Wall Street Journel, The NY Post, Yahoo News, USA Today, TMZ, and hundred of others. 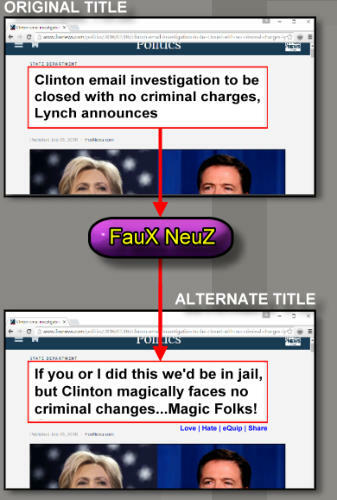 * What makes FAUX NEUZ truly unique is allowing members to suggest alternate titles for the news stories , both to define the true nature of the news story and allow other users to rate the titles to find the best one. The highest rated alternate titles are then prioritized for presentation to other members, and includes which member demographic LIKE or HATE the suggested alternate title, as well as the title the ‘other side’ likes. So why are we doing this? As we mentioned, our service is FREE, and we have no advertisers to avoid any influence on the delivery of FAUX NEUZ. We do this because we sincerely believe that the public deserves “real news” that isn’t spung for political reasons so that they can make informed decisions. An informed public makes more informed decisions, which is in the best interest of everyone. Since the 1987 assassination of the ‘FAIRNESS DOCTRINE’ - a law established in 1949 to help ensure controversial issues of public importance are presented in an honest, equitable, and balanced way - the country has become polorized by the lack of “real news”. Today’s news and media outlets are fueled by political parties, big business, and advertizers. FAUX NEUZ doesn’t think this is in the best interest of the American people. FAUX NEUZ corrects the problem by allowing members to provide and rate the best “true” titles for news stories, which are then prioritized and distributed to other members for consumption. FAUX NEUZ - It is the largest open socio-political experiment in the world. * FAUX NEUZ is not owned or affiliated with CNN, Fox News, MSNBC, The Wall Street Journel, The NY Post, Yahoo News, USA Today, TMZ, or any other media outlet mentioned herein. Additionally, FAUZ NEUZ only shares generic de- identified information with members, does not sell or share member identifiable information to external entities, and we do not have any relationship with any of these news and media outlets. 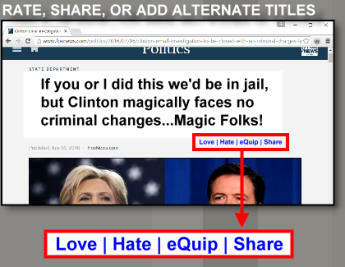 With FAUX NEUZ’s ‘eQuip’ members can suggest alternate titles, rate other member’s titles, disable FAUX NEUZ, or share with others on FACEBOOK, SNAPCHAT, or etc**. For more detail informatio on the FAUX NEUZ process, Please go to HOW TO FAUX NEUZ. FAUX NEUZ is a new way to get news. Instead of trying to sort through countless news websites, each with their own spin, to find the ‘real’ news, FAUX NEUZ provides a list of news stories focused on your interests and views. How is this done? FAUX NEUZ is a FREE online service that uses generic information about you, as well as your browsing habits, to provide news prioritized by others with similiar interests and backgrounds. It uses existing news stories from a wide variety of sources, including CNN, Fox News, MSNBC, The Wall Street Journel, The NY Post, Yahoo News, USA Today, TMZ, and hundred of others. * What makes FAUX NEUZ truly unique is allowing members to suggest alternate titles for the news stories , both to define the true nature of the news story and allow other users to rate the titles to find the best one. The highest rated alternate titles are then prioritized for presentation to other members, and includes which member demographic LIKE or HATE the suggested alternate title, as well as the title the ‘other side’ likes. So why are we doing this? As we mentioned, our service is FREE, and we have no advertisers to avoid any influence on the delivery of FAUX NEUZ. We do this because we sincerely believe that the public deserves “real news” that isn’t spung for political reasons so that they can make informed decisions. An informed public makes more informed decisions, which is in the best interest of everyone. Since the 1987 assassination of the ‘FAIRNESS DOCTRINE’ - a law established in 1949 to help ensure controversial issues of public importance are presented in an honest, equitable, and balanced way - the country has become polorized by the lack of “real news”. Today’s news and media outlets are fueled by political parties, big business, and advertizers. FAUX NEUZ doesn’t think this is in the best interest of the American people. FAUX NEUZ corrects the problem by allowing members to provide and rate the best “true” titles for news stories, which are then prioritized and distributed to other members for consumption. FAUX NEUZ - It is the largest open socio-political experiment in the world. * FAUX NEUZ is not owned or affiliated with CNN, Fox News, MSNBC, The Wall Street Journel, The NY Post, Yahoo News, USA Today, TMZ, or any other media outlet mentioned herein. Additionally, FAUZ NEUZ only shares generic de-identified information with members, does not sell or share member identifiable information to external entities, and we do not have any relationship with any of these news and media outlets.